This post is sponsored by Manitoba Harvest; however, all thoughts, opinions, and statements about being in-love with their products are 100% my own. The first salad I ever made outside of my parents’ kitchen was a caesar salad in my 6th grade Home Ec class. I barely remember a thing we made in that class besides this caesar salad, and it’s because 1) I was surprised it was so easy to whip together homemade dressing and 2) that was the start of my love affair with cooking. Later that week, I came home and replicated the salad for my family. It was gratifying to create something that nourished my family members and made them mmm and ahh. Memories are built around the dinner table, and to make a meal for loved ones is to offer them a nugget of contentment that they can pull out of their mental filing cabinets years later and somehow still feel a loving pang within their hearts. You might have guessed it, but caesar salad has a special place in my heart because it’s where this all began for me. I can’t possibly whittle all of my passion for cooking down to that one moment because there have been so many transformative moments that have shaped my feelings toward it, but I can say this: no matter how far I’ve drifted from my kitchen over the years, I come back to it to feel the way I did after making that caesar salad for my family. 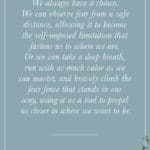 That feeling breathes inspiration into my life and soothes my heart when it becomes wary. 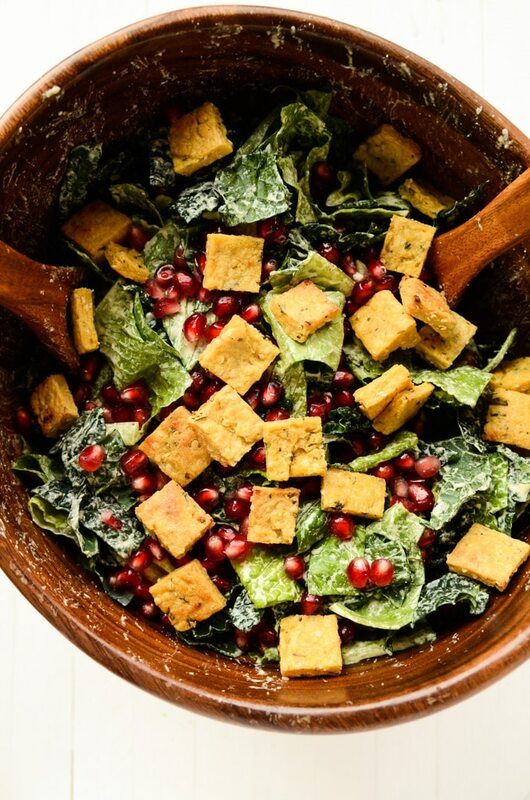 This vegan holiday caesar salad with hemp seed dressing is extra special because it’s filled with festive flare, packed with superfoods (i.e., hemp seeds, hemp oil, kale, pomegranate seeds), and built to serve a family. 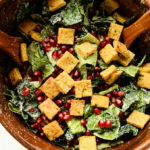 It’s a salad that will nourish, charm, and encourage heartwarming memories, and for those reasons, it’s one to be shared around the holidays. 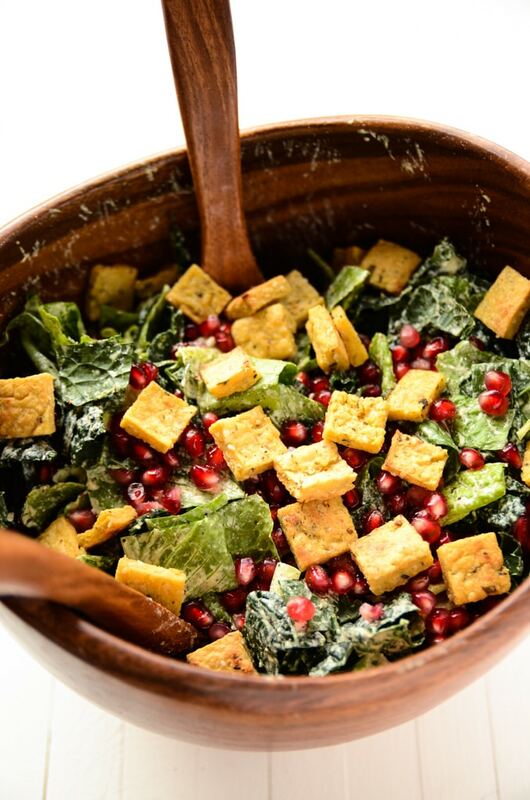 The base for this caesar dressing is Manitoba Harvest’s Hemp Hearts. I’ve tried many brands of hemp seeds, but these are my absolute favorite. 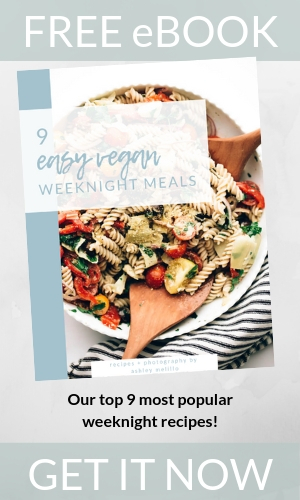 They yield an ultra-creamy texture and impart a mild flavor, so they’re wonderful to use as a base in creamy dressings, and they can also be sprinkled onto just about anything (e.g., oats, salads, hummus, yogurt, etc). 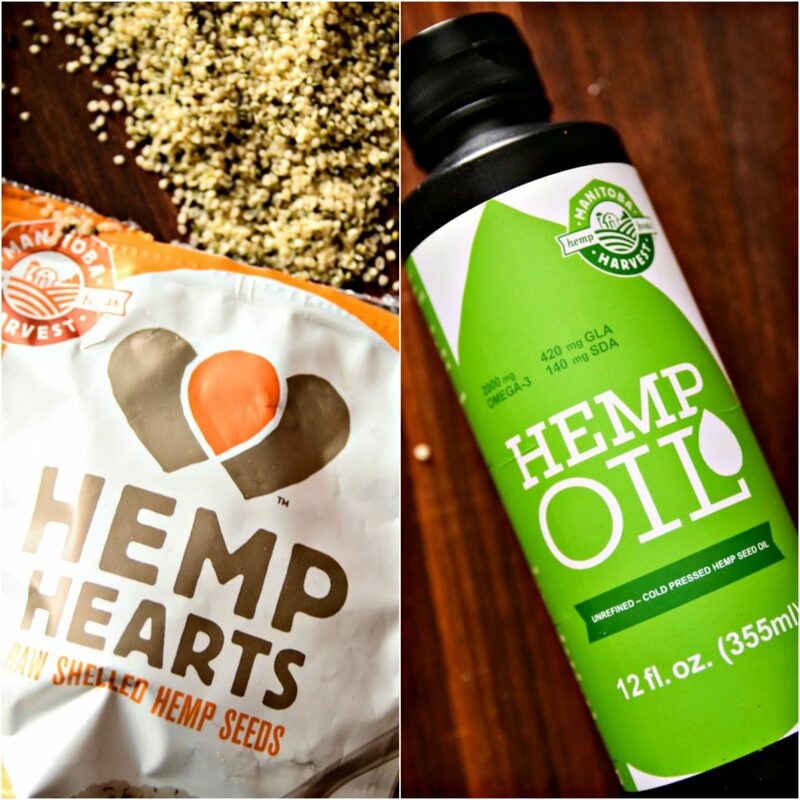 I’ve ranted on before about why hemp seeds are so fantastic for those living a plant-based lifestyle, but here’s a quick-and-clean refresher: they’re a complete protein source, 3 tablespoons packs a powerful 10 grams of protein, and they’re rich with omega-3 and omega-6 fats. If you haven’t used hemp seeds before, you’re going to have to take a delicious leap of faith with me. 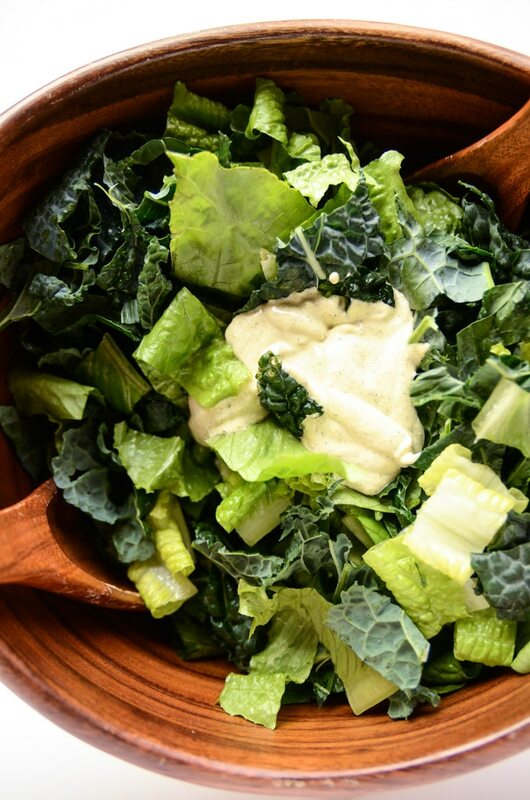 To make the dressing, you’ll toss hemp seeds, water, lemon juice, hemp oil, nutritional yeast, white wine vinegar, garlic, dijon, sea salt, and black pepper into a blender. 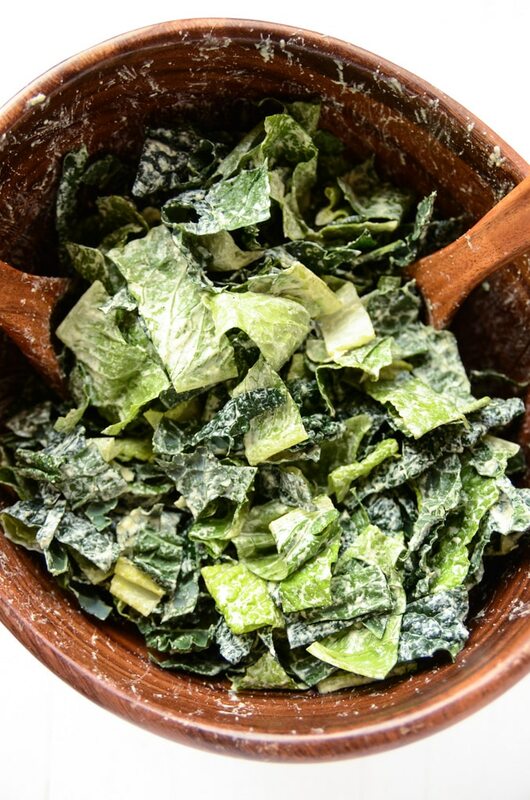 You’ll blend it all on high for a few minutes or until you have a super creamy caesar dressing. Not even kidding, it’s that simple. Best part? The fact that this dressing is uber-healthy will be a secret kept between you, me, and your blender. No one will guess it’s packed with this much goodness. And the croutons? Oh my. You’re in for a treat. These crunchy, chewy bites are made by whisking together boiling water, chickpea flour, garlic powder, hemp seeds, rosemary, and a pinch of salt. You’ll pour the mixture into a pan, let it chill for an hour, slice into croutons, and bake with a drizzle of olive oil until they’re golden and crispy. They’re packed with protein thanks to the chickpea flour and hemp seeds, and the rosemary adds a wintry touch of flavor. 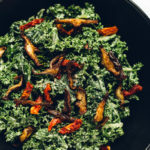 To assemble the salad, you’ll add chopped romaine and chopped kale to a large bowl, pour on the dressing, and toss to coat. 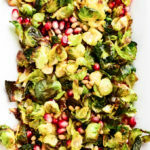 Then, you’ll sprinkle on those ruby-hued pomegranate seeds, protein-rich croutons, and a flurry of hemp seeds. The last step? You guessed it: serve it up to those loved ones and offer them a dish upon which to build happy memories. 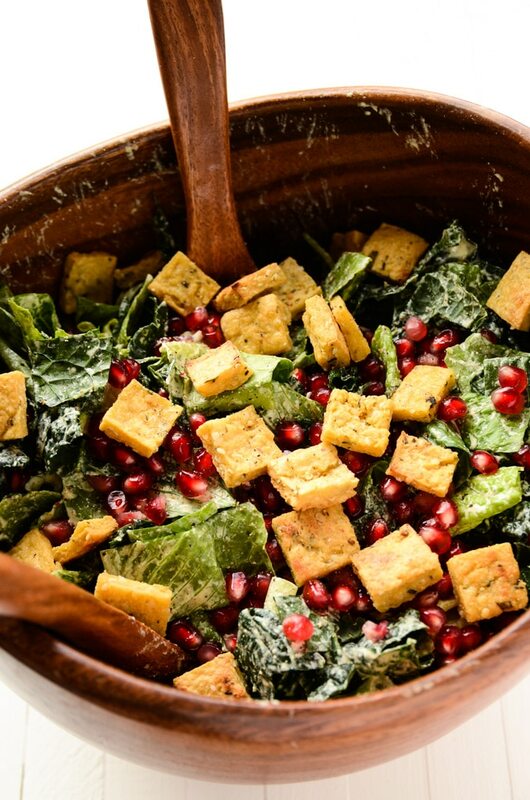 This festive caesar salad is far from ordinary. 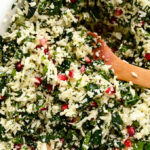 It's packed with superfoods (i.e., kale, hemp seeds, hemp oil, and pomegranate seeds), holiday flare, and a variety of textures to keep you and your guests coming back bite after bite. Slowly pour in the chickpea flour while whisking continuously. Whisk in the garlic powder and sea salt, turn off heat, and whisk another minute or until smooth. Stir in the hemp hearts and chopped rosemary. Line a small (9x13) baking pan with parchment paper. Pour the mixture into the pan and use a spatula to spread it evenly across the pan. To make it easier to smooth out, spray both sides of a spatula with cooking spray or olive oil, and gently smooth out the batter. Lift the parchment paper out of the pan, and slice the chickpea batter into equally-sized croutons. Spread the croutons out over a pan that has been lined with parchment paper. Drizzle them with olive oil, sprinkle with sea salt, and toss to coat. Bake for 25-35 minutes, stirring every 10 minutes until crispy and golden. 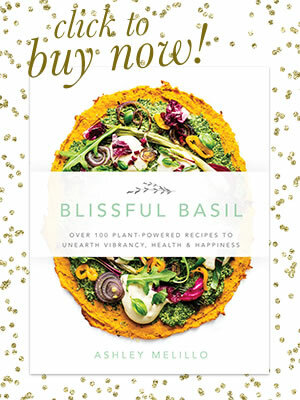 Add the hemp hearts, water, lemon juice, hemp oil, nutritional yeast, white wine vinegar, garlic, dijon, sea salt, and black pepper to a high-powered blender. 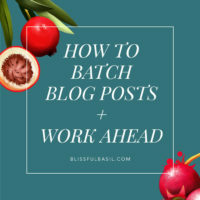 Blend on high for 1-2 minutes or until completely smooth. Refrigerate until ready to use. 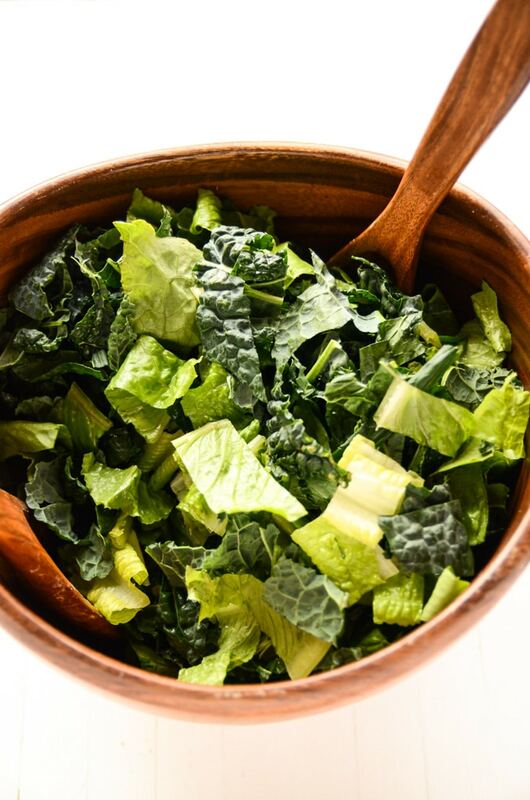 Add the romaine and kale to a large bowl, pour the dressing over top, and toss to coat. 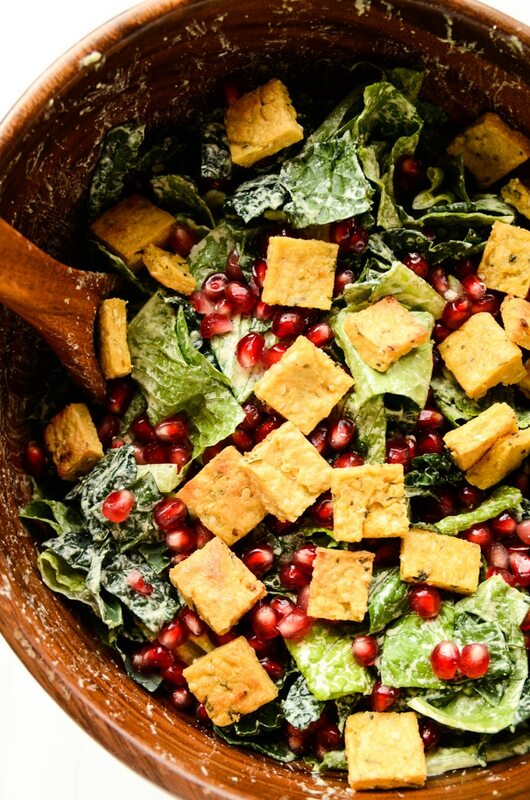 Top the salad with as many croutons as desired, pomegranate seeds, and hemp hearts. Oh goodness, those croutons look dreamy!! And that dressing, so creamy! This looks like my kind of salad! I have made fries from chickpea flour but using it as croutons is a great idea! Thanks so much, Janet! Chickpea fries sound amazing. I never thought to do that, but I will have to try it out! Do you have a recipe for them? 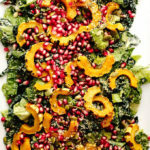 What a great twist on a ceasar salad! Can’t wait to try it. The salad looks delicious Ashley! I’ve never tried hemp hearts before, so I’m curious as to their taste. 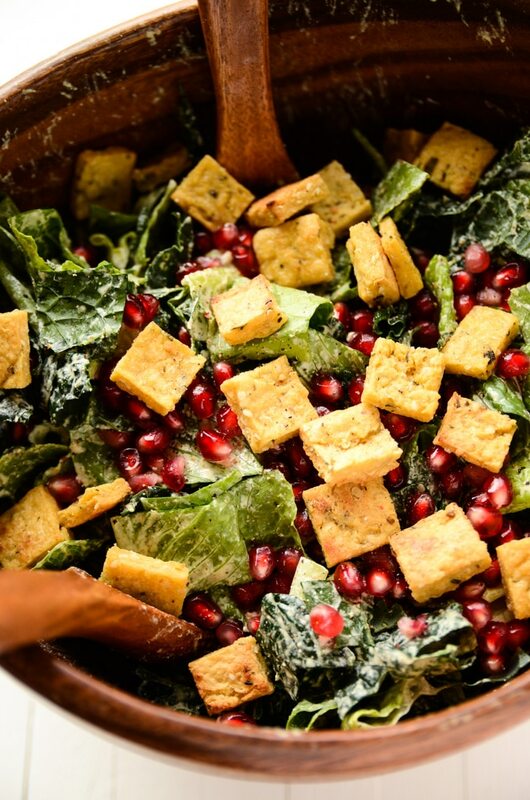 I love the sound of those croutons…especially with the rosemary. I am kind of obsessed with rosemary and have 2 large rosemary plants right now! 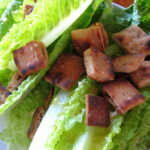 Your “protein croutons” are basically Shan Tofu or Chickpea Tofu!I recently found a recipe for them online that began with soaking the flour overnight( much longer than yours and in the original recipe it was suggested that they could not be baked because they would melt, only deed fried. ) 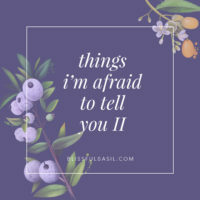 So I am super duper excited to give your version of it a try! I tend to eat tofu everyday or every other day and I have recently been reading that its not that great for you. I dont see any issues with it or effects to my body, but I guess it will be better to at least have another option to vary! About the dressing… I have a new thing going on with oil… where I say, if I cant see it I wont use it. Meaning that I will happily dip my garlic bread into it , but I dont find it necessary to have it in cooked foods, or dressings. So would it be worth the try to sub the 2 T of oil for 2 T of water? Hi, Claudia! I didn’t even think about that, but it’s so true; they are like chickpea tofu. I hear you about the tofu. I’ve found that it’s tricky to narrow down the facts on whether or not it’s good or bad or just something that should be enjoyed in moderation. I didn’t use to eat any tofu, but since going vegan I enjoy it about 3-4 times per month. I tend to opt for sprouted tofu as I’ve heard that it’s better than more processed varieties. 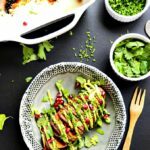 Yummy yummy need to try this recipe asap! Thank you! I forgot to ask! Can you eat the croutons straight out of the fringe without baking them?? Hi Claudia! Yes, that shouldn’t be a problem since each of the ingredients can be enjoyed raw on its own! Hi, Daphne! You can use raw cashews in the dressing instead of hemp seeds.